Aside from the Air Jordan 7 Olympic and Gold Medal, another edition of the famous kick is set to be released in a GS edition. 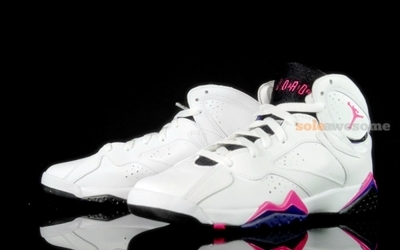 Called the Air Jordan 7 GS “Fireberry”, the White/Purple-Pink colorway of this sneaker has surfaced and is rumored for release anytime from now. The new edition of the Air Jordan 7 GS features a white leather upper accented with touches of pink and purple throughout the entire shoe. We will be keeping you updated about this kick!